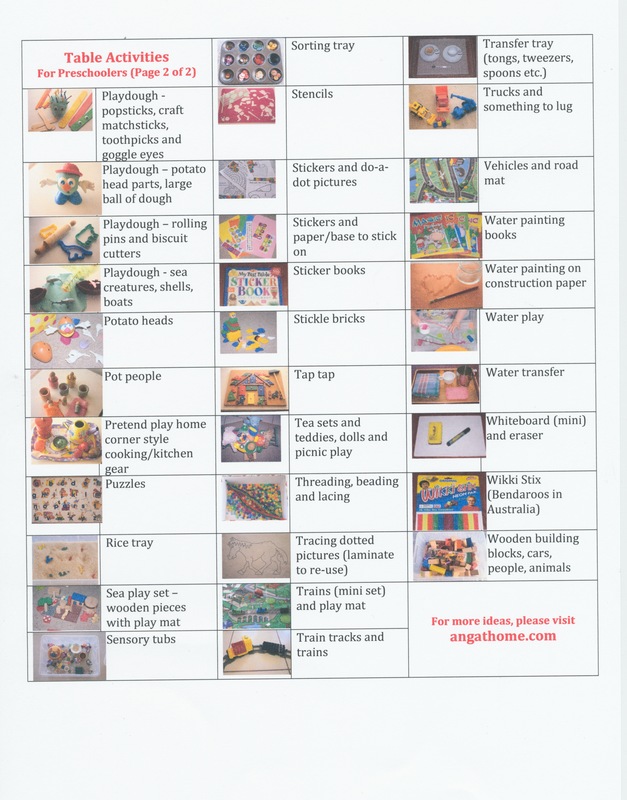 Following on from yesterday’s post (list of highchair and table activities for babies and toddlers), here is my collection of preschool ideas to use for any time a quiet, attention grabbing activity is needed. Please see yesterday’s post for links to articles on how to train your children to sit for an extended period of time, even at a young age. Even the most interesting activity will not stop a child from wandering about if that is what they are used to doing. There were too many ideas to fit on the one page, so there are 2 pages to download. Please be aware that because of the large number of photographs on the posters, the downloads may take a long time to come through. Just walk away and have that cuppa! You’ll notice some activities are repeats from the toddler list. I have done that so those who do not have a toddler do not need to print out that chart as well as this one. Having said that though, you may find ideas from the older (coming next post) or younger category that I haven’t repeated may still be of interest to your child.